I did a little rearranging here at happymommy. I figured out how to add a widget and have permanent links in the sidebar and I even have analytics. Now, I will know when someone other than my mom and father-in-law visit! :) In my older posts there will be duplication of a few banners, but I am not about to go back and delete the extra one for six months of writing. If you read old ones, just deal with the extra banners for my Clever Girls! Now back to Disney. Lilly and I really did have a fabulous time at Disneyland and California Adventure. We walked, rode rides, played, walked, ate, walked, swam and slept. Then we woke up and did it again, four times. There is something to be said about the "happiest place on earth." It really isn't the happiest place for about 80% of the people in two parks. Couples are fighting, children are throwing tantrums and everyone is rushing to get to the next place. This is, of course, the busiest time of the year for Disney and I could not believe the number of people there each day. Not to mention the crazy amount of money that one must spend to get a great Disney experience. Now, I will admit, I spared very little expense with Lilly. She pretty much got whatever she wanted and I loved to watch her face. Once I got past the initial shock of the amount of people, the cost and the lines, I settled in to enjoy my girl time with Lilly. I watched her dance the twist during the Celebration Parade. We rode It's A Small World 9 times. Every single time she was amazed and sang the song louder and louder. We had dinner with Goofy, watched the Pixar Parade and then we rode It's A Small World again. Every night Lilly passed out from exhaustion and as I took pictures of her sleeping with more and more stuffed characters I figured out that Disneyland really is the happiest place on earth, if you let it be. 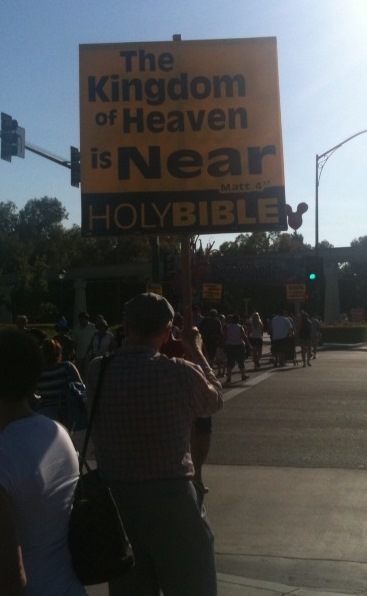 Oh, and if you need a little evangelism before you enter the park, there are people there who cover that too. Wonder how many converts they get? I had no idea you were going to Disneyland! When did you get back? Love your new blog! Love you! videos and the pictures. Lilly will be talking about this for years to come.